After you’ve enjoyed your outdoor living space all spring and summer, don’t let chilly temperatures and fewer daylight hours stop the fun. Fire pits and outdoor fireplaces provide both a focal point for landscape design and a toasty way to bring the party outdoors in autumn. And these instant gathering spots come in sizes (and budgets) to suit almost any heat-seeking homeowner. If you can envision the gang toasting marshmallows or a cozy night with your love in front of the flames, you’re halfway there. Different models are fueled by wood, propane, natural gas or electricity, or even alcohol-based cartridges in the case of ventless fireplaces. Some home stores and specialty shops sell fire pits and fireplaces out of the box. They may be fueled by wood or propane, and typically look like an oversized version of the cheery vent-free gas fireplaces that you may already use indoors. Is This Something You Can DIY? If you’re on a tight budget or just like to make your own landscape elements whenever you can, you can tackle your own fire pit project. You’ll probably start with clearing a patch at least 25 feet from wooden house elements, trees or other flammable materials. Most people taking this approach put down a layer of pebbles in the bottom of the “pit” and circle them with overlapping rings of concrete blocks. A homemade fire pit is a popular project on a lot of home decor websites. 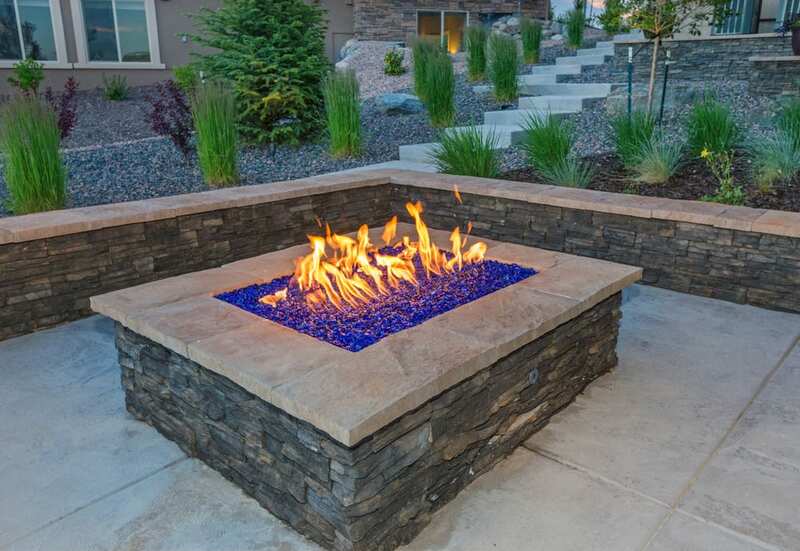 Many experts also provide step-by-step instructions for making simple or elaborate DIY fire pits and outdoor fireplaces. If you want to make a statement with a fire pit or have an outdoor fireplace as the centerpiece for your luxury outdoor kitchen, there are lots of exciting possibilities to explore. Materials range from river rocks to sleek brass or copper facades. High-end outdoor fire options can include anything from a pizza oven on an adobe patio to a modern temperature-controlled fireplace that heats a room-size outdoor space and looks stunning at the same time. Another sleek option for the most daring: a terrace area sunken a few feet below the rest of your landscape, complete with a fire pit. Since fire is involved in all the models, you’ll need to learn the same safety standards you use indoors with a gas range or outdoors when you’re building a campfire. Never leave the fire burning without someone there to watch it, for example, and clean the pit or fireplace on a regular basis.